I was in northeast India, this trip particularly Assam and Manipur states. The seven states of Northeast India, altogether about the size of Oregon, are home to something like 200 different languages, most of them pretty much, or completely, unknown to linguists. Training local students at Gauhati University in Assam and Manipur University in Manipur in linguistics and language description; carrying out research on the Boro language of Assam and several small languages of Manipur; and consulting with local communities that have or want to begin programs in literacy and language development. Our department is internationally known for this kind of work, and the reason why we’re known for it is because we keep doing it. Also in my work in northeast India I frequently get requests from communities who want to have a linguist come and write a grammar of their language, and these are wonderful research opportunities for our Ph.D. students. Currently I have two Ph.D. students working in Assam: Linda Konnerth, who is writing a grammar of the Karbi language, and Krishna Boro, who will write his dissertation about a language called Hakhun Tangsa. Now I need to find someone to go to Manipur and write a grammar of Monsang. Kaziranga National Park in Assam. If you go in the winter you can see an amazing array of wildlife – deer, buffalo, elephants, gibbons, langur monkeys, hoopoes, hornbills, kingfishers, owls, eagles, and especially lots (lots!) of rhinoceroses. Be sure and take the elephant ride – there’s nothing quite like bobbing along on the back of an elephant while the cute little rhinos wander around underfoot. 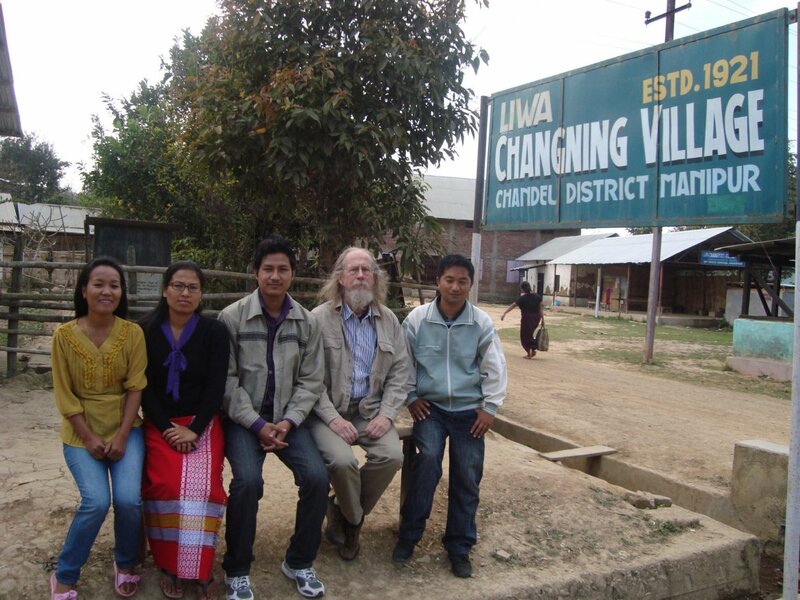 Most memorable this trip was a visit of several days to the Monsang community and their neighbors in and around Liwa Changning village in Chandel District of Manipur. The wonderful hospitality these folks showed me was amazing. Also truly memorable was the all-day meeting of the Monsang Literary Society, where representatives of the six Monsang villages in Chandel got together to talk about how to develop a writing system for their language – which is spoken by about 2,000 people altogether.